A wide array of sensors and modules control your transmission, but what exactly do they do and how do they lead to symptoms of transmission failure? In many cases, non-transmission components cause problems. The number of modules that vehicles use depends on their complexity, in many cases, there are at least ten that directly or indirectly control or provide feedback to your transmission. Often other modules like the BCM (Body Control Module) play a role in transmission function. Below is a list of various modules and sensors that regulate your automatic transmission. Please note that problems and their causes vary relative to specific makes and models – these are simply the most common. All automatic transmissions use a control module to regulate speed, gear changes, and clutch engagement. The TCM makes decisions based on the information it receives from the engine, making it the key to shifting gears and changing the speed. A TCM recognizes when the clutch is engaged and disengaged and reads RPMs, then executes an order based on driver feedback. Some modules have an internal memory that will recall your driving habits and apply that data to your transmission’s performance. A powertrain control module also controls engine and transmission functions. It is responsible for timing shifts, shift feel and engaging the clutch. When your PCM fails your transmission is likely to stop shifting, shift too soft or harsh or cause complete transmission failure. 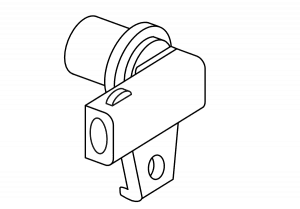 The Mass Airflow Sensor measures airflow into the engine and uses that information to regulate air and fuel ratios and determine engine load. The Throttle Position Sensor measures throttle (gas pedal) position, having a direct impact on engine performance. The Manifold Absolute Pressure Sensor measures manifold pressure. Its used to measure engine load. It also measures altitude and controls engine performance. The Intake Air Temperature Sensor measures the temperature of the air while it enters the intake of the engine. It’s used to control the air/fuel mixture of the engine. It’s also part of the pressure control system for the transmission. As temperature changes, so do the sensor’s electrical resistance and voltage signal. The Differential Speed Sensor measures vehicle speed. Failure may inhibit activation of overdrive and the converter clutch. Overdrive is a function that allows you to cruise at a sustained speed, but reduced engine rpm. This provides better fuel economy, lower noise, and reduced wear on mechanical components. Engaging and disengaging overdrive requires a switch. When this switch fails transmission problems occur. The Vehicle Speed Sensor measures vehicle speed. When it fails the transmission can stop shifting or shift late and harsh. A bad VSS may also inhibit overdrive and the converter clutch. The Air Conditioner Sensor signals the PCM when the air condition is on or off. The AC switch will affect engine RPM at a stop. A malfunctioning AC switch can result in problems that feel as though they are transmission related. The Transmission Range Sensor tells the PCM the position of the transmission shifter. The PCM uses this information to control which gears of the transmission to enable or disable. When the TR sensor fails it can cause wrong gear starts, no upshifts, or what feels like a falling-out-of-gear condition. The Brake Switch measures brake pedal position. Its primary function as it relates to the transmission is to release the converter clutch while braking. When it fails the converter clutch won’t apply, or it may chuggle while coming to a stop. The Coolant Temperature Sensor measures engine coolant temperature. It’s used to inhibit overdrive and the converter clutch when the engine is too cold. Failure will severly impact engine performance. The Turbine Shaft Sensor measures input shaft speed. The PCM uses the information provided by the TSS to determine whether or not the transmission is slipping. When it fails it usually result in shift timing problems. Depending on the manufacturer, it can cause multiple shift-timing and shift-feel problems. The Transmission Fluid Temperature sensor measures the temperature of the transmission’s oil (AFT). Its primary function is to inhibit overdrive and converter clutch operation when cold. On some models, it also inhibits certain gears based on the temperature (too hot or too cold).